Only 17 villages hold the highest rating of grand cru. Located next to Burgundy, the terroir has more limestone than chalk. Sparkling wines are made all over the world. Champagne, the region in northeastern France, makes the most heralded and sought after sparkling wines that serve as the role model for most others. Centered around the cities of Reims and Epernayand covering nearly 33,000 hectares of vines, sparkling wines from this region are the only ones that can really be called champagne. Unfortunately many people mistakenly refer to any wine with bubbles as being champagne much to the dismay of those in the know. Let's briefly talk about the production method of sparkling wine, and then find out what sets champagne apart from the rest. Sparkling wine can be made by a number of different methods: The most simple method is to inject still wine with carbonic gas, like with soft drinks, giving the wine bubble. This is a highly industrial method which can be easily replicated. Other methods are slightly more complex. A traditional method is simply to bottle a wine which is still fermenting. Here the fermentary yeast will continue to eat away at the wine's sugar creating a sparkle. This is more complicated to control the outcome of the final product and without careful attention can lead to bottles exploding because of excessive pressure created by fermentary gases. Grapes are pressed and wine is made like any other still wine and fermented dry, either in tank or barrel. A blend of various tanks and/or barrels either comes from the single year or different vintages. At this point the wines are dry and have no bubbles. The wine is then bottled in champagne bottles. A small amount of a mixture called liqueur d’expedition is added in a precise quantity, containing some sugar liquid and yeast. The bottles are closed with a crown cap (a fancy name for a beer cap cause it looks like a crown, get it?) They are stacked on their sides in a cellar. Over the next few months the sugar and yeast begin to ferment. This causes carbonic gas to form within the bottle, which creates the wine’s bubbles. The yeast cells and other by-products of fermentation remain in the bottle, leaving sediment on the sides of the bottle. The ultimate goal is to have a clear wine that sparkles. So in order to achieve this, the bottles are adjusted little by little from their sides until they are standing upside down. The sediment has now slid down and sits within the neck of the bottle atop the crown cap. The necks of the bottles are immersed in ice water where a small amount of wine in contact with the sediment freezes. The bottles are then disgorged: in a specialized machine and within a millisecond, the crown cap is removed, the carbonic gas in the bottle forces the frozen sediment out, and the bottle is topped up with the same quantity of wine that was lost, perhaps a milliliter or so. At the same time, producers normally add a dosage, that is a tiny amount of sugar syrup that helps to balance the sparkling wine’s intense acidity. The amount of sugar added in the dosage will also determine the syle of champagne, be it Extra Brut (very dry), Brut (dry) or Extra Dry (which is, in spite of its name, sweet). There has been a recent trend by producers to make champagnes without dosage, or non-dose. Many of these can have acidity levels that are too severe for the general consumer. However, when the champagne is made from very healthy grapes and allowed to spend a long time maturing on its lees, they can be very good indeed. What makes champagne different from sparkling wines from other regions of the world? 1. The grapes: Champagne uses three grapes primarily: Chardonnay, which gives bright acidity and elegance. Chardonnay is like the nervous system of Champagne. Pinot Noir, which gives structure and body to the wine. Pinot Noir is like the muscular aspect of champagne. Pinot Meunier, gives volume and fruit. It is the flesh and bones of champagne. 2. The soil: Champagne has a very deep layer of chalky soil, white and dense yet friable. This soil provides drainage but also retains water, enabling the slow emission of moisture that also imparts the wine with a particular minerality. alcohol and lower acidity which is why hotter new world climates often produce sparkling wines that lack finesse. 4. Savoie-faire: Let’s face it, thousands of producers have been making champagne in the region for hundreds of years. With such experience, clear cut distinctions can be made between the top terroirs (Grand Cru and Premier Cru), not to mention the knowledge of local enologists, the availability of equipment and a locomotive-driven publicity train that ensures that Champagne is associated with luxury and class. While sparkling Saumur can be fantastic, it is usually just an add on to a Saumur-Champigny producer’s line of wines. Champagne is the real deal, and the only thing that most producers in the region make. Champagne, like Cognac, is a region that revolves around commercial houses whose names have become instantly recognizable around the world (Moet, Taittinger, Veuve Cliquot, Mumm, etc). Production levels at these houses are huge, and quality levels are extremely consistent. Most of the large houses own minimal vineyards, and the great majority of their base product is purchased from any number of the 12 thousand farmers that grow grapes. Prices for the pressed wine or grapes is usually good, so farmers are happy to simply do what they like to do best, work in the vineyards, harvest healthy grapes, make the wine and sell it in bulk to the big houses. No need to buy expensive bottling equipment, nor store bottles, nor get out and sell the bottles. The large houses employ hundreds who control quality, blend their thousand of tanks and oversee bottling. The most important element of the large houses is establishing the name of the house and getting the product into customer’s hands around the globe. While the past half century has seen many independent growers bottling their own product, spikes normally occur during hard economic times when the large houses lower their bulk purchase prices. The Iraq war of 1991 is often cited as a period when producers started bottling some of their own production and selling it under their own names. In contrast to the aforementioned houses (also known as NM or Negociants-Manipulants), the RM (Recoltants-Manipulants) actually grew their own grapes, made the wine, then bottled and commercialized the champagne directly from their properties. Of course the beginning was tough going, attempting to compete with global conglomerates and getting customers out of their comfort zones and convincing them that the better-known product wasn’t necessarily better than something they had never heard of. ​Today in the hipster wine world, grower champagnes are all the rage. No dope somm wants to be pouring champagne from a large house and risk his coolness factor be diminished among his peers (unless, perhaps, by doing so (s)he gets a free trip or kickback from the large houses. they farm and their attempts to deliver those soil and exposure particularities that only this unique region can deliver. Unlike Burgundy, where vineyards are rated according to their quality, the classification in the Champagne is rated by villages. Established at the end of the 19th century, the ratings (called the Echelle des Crus or Ladder of Growths) are expressed from 80% to 100%. After a grape harvest was complete, negociants would meet with a grower’s council and decide on the price for grapes that year, based on quality and need. Producers in Grand Cru villages were guaranteed to receive 100% of that price, while those in Premier Cru villages were guaranteed to receive between 99 and 90% of that price. In Champagne, all 318 villages are quality rated. Some 257 of these are assessed somewhere between 80 and 89. One rung higher come the 44 premiers crus, which range in their classification from 90 to 99. Top of the pile are the 17 grand cru villages, all rated 100%. These wines are considered to offer the highest qualitative potential, taking into account the quality of the soil, the nature of the subsoils and the micro-climate. Yet while there may be fewer grands crus in Champagne than in Burgundy, as the designation is applied to whole villages and not just specific vineyard sites, these 17 crus between them cover a far larger total area of vineyard than Burgundy’s equivalent sites. 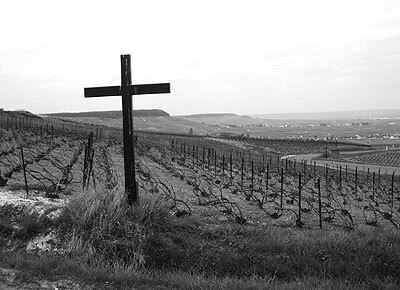 There are more than 4,360 ha (hectares) of grands crus in Champagne – close to 14% of the appellation’s vineyards. Literally meaning chalk mount, Cramant is situated to the south of Épernay on the renowned slopes of the Côtes des Blancs. Its terroir of chalky sediment ensures excellent drainage and plays an important role in regulating temperature. Its white color reflects light and heat, contributing to the full maturation of the grapes. Champagnes from Cramant tend to be very mineral-driven with pronounced acidity—you can really taste the chalk in champagnes from this village. Squeezed between Cramant to the north and Oger to the south, the vineyards of Avize stretch in a straight line for less than 2 kilometers. The vineyards face east and southeast along the gentle slope of the Côte de Blancs. The subsoil consists entirely of Belemnite chalk (derived from an accumulation of cuttlefish fossils) that is particularly deep on the slopes. The vineyards in Avize form a type of bowl between Cramant and Oger, and perhaps benefit from more sun and more ripeness of grapes throughout the day. In contrast to Cramant which is sheltered by a hill, Avize gets the full blast of the prevailing winds that can be cold and wet in bad years. Le Mesnil-sur-Oger is considered by many to be the top grand cru village in the Côtes de Blancs. The vineyards are most famous for Champagne Salon as well as the famed Clos de Mesnil of Krug. The village produces grapes with high acidity, permitting the wines to develop slowly over the years while always retaining their taut structures. Bouzy is perhaps the most revered grand cru village in the Montagne de Reims. Known for its Pinot Noir, Bouzy enjoys a perfect exposition to the southeast. This helps its red grape ripen fully and develop rich, complex flavors. Ambonnay was a thriving town in the Middle Ages and was erected on the spot of a Gallo-Roman villa. At the beginning of the 11th century, Templar monks built a church in the center of town, a beautiful example of Roman architecture gradually modified with Gothic touches over the years.